Attacking Principle: Reverse Pivot to outwit the defence in Set Plays! 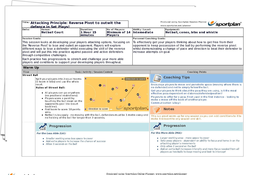 Netball: Attacking Principle: Reverse Pivot to outwit the defence in Set Plays! It is important your players have a number of a attacking skills in their tool box to help them get free from their defence. The session begins with a fun warm up to get your players thinking about their movement, whilst allowing complete freedom for them to attempt new skills. To complete a reverse pivot successfully you have to maintain a narrow foot base and fast feet, of which the session helps to develop. ‘Reverse Pivot in 3's’ allows your players to practice their reverse pivot in an on court context with limited pressure, before increasing the intensity of the defence to make the situation more game like. 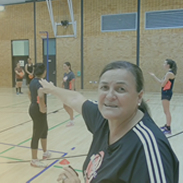 The session concludes with a game of netball, with certain conditions placed upon the game to get your players demonstrating what they have learnt. This session will help develop your players reverse pivot to help them outwit their defence to be free to make an offer for the ball. Developing these skills will help your team stay in possession and increase your opportunities on goal.